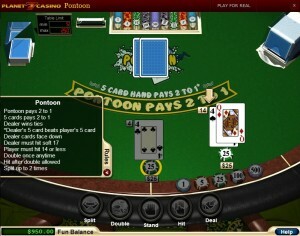 ﻿﻿﻿﻿﻿﻿I love playing blackjack, receiving generous bonuses and enjoying high quality games. One of the casinos that were recommended to me and that supposedly offered all of the things I like is Pl﻿anet 7 Casino. I wanted to try something new and hence I decided to join this casino and rate my gambling experience. Planet 7 Casino seemed extremely luxurious with its red background and gold letters; therefore, from the start I felt like I could enjoy playing blackjack at this casino which uses Realtime Gaming software. I’ve heard this was a perfectly safe and reliable casino, so I decided to sign up and give it a try. ﻿One of my favourite blackjack variants is Perfect Pairs Blackjack. I really like the excitement this game offers as well as the big payouts to those who are lucky enough to get one of the winning combinations. Therefore, I was glad to find out that I can play this blackjack variant at Planet 7 Casino alongside other six blackjack games. No matter whether Pontoon or European blackjacks are your favourites or you like Match Play 21 and Super 21, you can enjoy all of them at Planet 7 Casino. Finally, the last blackjack game at this casino was Face Up 21 and that is another variant which I personally adore and play regularly. The impeccable Realtime Gaming software worked smoothly and responded pretty fast to my commands. 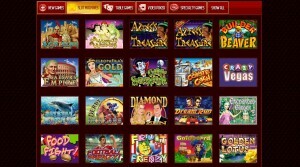 All of the 120+ games at Planet 7 Casino were developed by Realtime Gaming. I really liked the preview option since I didn’t have to open every single game just to see how it looks. Anyway, the game selection was relatively good and there were many popular slots such as Mayan Queen, Texas Tycoon, Naughty or Nice and Lucky Lust. Besides blackjack, some other table games I was able to play were American Roulette, Craps, Baccarat and Red Dog. Finally, there were also games for video poker fans like Loose Deuces, Sevens Wild, Deuces Wild and etc. 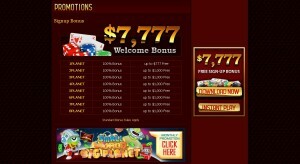 The welcome offer at Planet 7 Casino is pretty simple but attractive. The first deposit bonus is 400% match bonus up to $4,000. In addition, I was intrigued by the special bonus designed for table games players. If I wanted to receive 80% match bonus on any deposit from ﻿$30 to $10,000, I would have to enter the code P7TABLES80 and wait for my account to be boosted. Since this promotion is for table games, blackjack included, the wagering requirements were 60 times deposit plus bonus amount. In case I wanted to spend some time playing slots, I could receive a special slots bonus of 100% match on deposits between $30-10,000. The coupon code for this offer was P7SLOTS100 and the wagering requirements were half of those for table games. Furthermore, I wanted to be a VIP member at Planet 7 Casino after I saw the VIP bonus offer for all games which included 130% match bonus on deposits from $100 to $10,000 and only 50 times deposit + bonus amount wagering requirements (for table games). There’s a whole host of other reload and bonus offers, from a weekend deposit bonus (up to 130%) and a free $50 free chip for players that deposited a minimum of $200 in the calendar month. One of the first things I do after I join a casino is to check whether it supports mobile devices. Planet 7 Casino does support smart phones and tablets thanks to its mobile responsive design. Users who own iOS and Android mobile devices can simply visit Planet 7 Casino via their smart phone or tablet and start playing instantly. In my opinion, the mobile version of Planet 7 Casino is very good and well organised. Of course, I checked which blackjack variants I can play and there was only Classic Blackjack on the menu. Nevertheless, the game play was perfect and it kept me entertained when I wasn’t able to play on my laptop. deposit methods I could use were credit cards and wire transfer. I could also use the same methods for withdrawing my winnings including a cheque withdrawal. The minimum deposit amount is $50, whereas the deposit processing time is usually instant. Withdrawals take some longer depending on the method, but, in general, they are processed within up to 7 business days.